Today we celebrate the life and music of David Bowie. 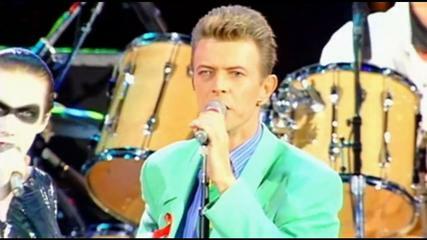 I remember seeing David Bowie live at the Freddie Mercury Tribute Concert back in April of 1992. I was spellbound throughout the entire day and seeing Bowie live was a treat to say the least. Bowie impressed me hugely due to his ability to constantly reinvent himself and at times force changes and shape musical genres. Actor, fashion icon and musical master, his music will live on forever. As a drummer, my favourite tune would have to be, Let’s Dance featuring Omar Hakim. As an actor, it has to been Labyrinth! The BBC news report can be read here.